If you've ever dreamed of owning a Frank Lloyd Wright house, you have more chances of making your dream come true than you might think. According to Inman News, there are 17 Wright properties currently on the market in cities around the country. Prices are a little steep, but then again, how often do you get a chance to own a piece of architectural history? The work of Frank Lloyd Wright tends to inspire almost slavish devotion from his admirers, many of whom undoubtedly dream of owning a home designed by the iconic architect. Once hailed as the greatest artist this country has ever produced, Frank Lloyd Wright has become synonymous with modern American architecture. As of today, some 270 Wright-designed homes are still in existence. But as Inman News reports, there are more available for sale than you might think. Click through to see some of Wright's most exceptional properties on the market today. As an active architect for the better part of seven decades, Wright remained at the cutting-edge of building innovations throughout his career. The Cooke House, a 1950s-era "hemicycle" sculpture, was well ahead of its time. Construction on the home began two weeks before Wright's death in 1959. But with this posthumously-crafted home of the future, observers can see glimpses of Wright's world-renowned designs for the Guggenheim Museum, which, coincidentally, also opened in 1959. Pictured left is an early model of the home that highlights its unique form. The first rendering of the home was recorded in 1953, when Maude and Andrew Cooke pleaded with Wright to construct their dream beach home. After Wright's death in 1959, the Cooke family lived in the 3,000-square-foot home for the next 23 years. By the time the next owners moved into the home in 1983, much of the interior needed to be restored. The new owners installed central air conditioning to protect the home from humidity and installed a gym, swim spa, sauna and a deep water boat dock built to fit two large yachts. A photo of the 14-foot swim spa installed by the current owners. In an interview, Daniel Duhl, one of the current owners of the home, describe visitors expressing an almost religious appreciation for the house. In his 1932 autobiography, Wright described the Coonley Home as his "best house." In keeping with its designer's high praise, every subsequent owner has gone to great lengths, and even greater expense, to steward the home into the 21st century. Pictured left: A view of the home's meditative reflecting pool with lily pads. After falling into a state of "deferred maintenance," as the listing agent so politely puts it, the home was purchased in 2000 by owners who made painstaking efforts to rehabilitate the property. Tile floors were restored by hand; a living room mural was recreated by artisans from a small remnant of the original; and all the electrical equipment was brought up to modern standards great detail to Wright's initial design. The owners went to great lengths to replace aging appliances and wiring in the home while keeping the spirit of Wright's original design. After years of improvements undertaken by several owners, the home now stands at 6,000 square-feet and includes five bedrooms and baths. The original owner, Avery Coonley, was the heir to an industrial fortune who spared no expense in his plans for the home. The fine detail put into the ceramic tiles and beautifully crafted stucco walls offer a glimpse into how seriously Wright took this project. At left, a view of the carefully restored ornamental tiles leading to an outdoor patio. As a master of what we now classify as the Prairie School of architecture, Wright put exceptional detail into this exemplar of the style. One of the largest of Wright's prairie houses, the 5-bedroom, 3-bath home sits on 2.3 acres of verdant woodlands. Another of Wright's many homes to be listed on the National Register of Historic Places, the Gridley Home has been carefully maintained throughout its century-long existence. At the same time, many modern amenities have been added to the home with an eye to Wright's original floorplans. The home includes a Roman fireplace, a new gourmet kitchen, an updated media room and a games room. The home exemplifies the prairie style with its low roof, overhanging eaves and windows grouped in horizontal bands. Wright dubbed the home "Ravine House" because of its proximity to a wildflower-filled ravine to the south of the house, making the property an even more idyllic representation of its country style. From futuristic sculptures to experimentation with old Victorian motifs, Wright's varied career bookends two very different periods in architecture. The Thomas Gale House, built during the early years of Wright's career, shows signs of his unique adaptations -- and sometimes straight mutations -- of his contemporaries' designs. The Gale House exhibits his unorthodox reinterpretation of the Queen Anne style. 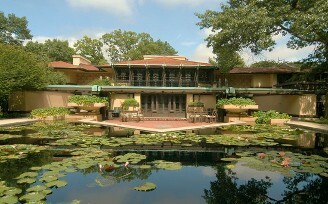 The Gale House reflects a key point in Wright's early career. It's characterized by what the Frank Lloyd Wright Building Conservancy calls an "irregular composition" for this style of house, indicative of the young architect's blossoming sensibility. At left, a photo of the dining room and an unusual octagonal bay window arrangement. Built at an altitude of 6,000 feet on a 10-acre site in the foothills of the Wasatch Mountains, the Stromquist house is as much about the natural environs that surround the home as it is about the property. Inside and out, the home reflects Wright's interest in the natural order. The main house consists of three bedrooms, each of which was positioned to take full advantage of the lush greenery surrounding the home. The home is built on a grid of parallelograms, as if to echo the twin perspectives of natural calmness and human ingenuity. Not pictured is a Frank Lloyd Wright foundation-sanctioned handmade area rug from Nepal. In addition to architecture, Wright had a natural affinity for interior design, and many of the furnishings reflect his aesthetic sensibilities. Nature and science converge in this laboratory/office/garage multi-purpose annex. It was said of Wright that he valued nothing more than serenity, and this picturesque property seems to offer just that. The Tracy House is one of Wright's "Usonian Automatic" houses. Listed on the National Register of Historic Houses it sits on a bluff overlooking Puget Sound. The house comes with a bonus for Wright buffs: a complete set of archival documents including original plans, construction photos, and correspondence between the Tracys and the architect. Giving new meaning to the words "sweat equity," the original owners cast the more than 1,700 concrete blocks for the construction themselves. The designs were based on Wright's famous "textile block" houses built in Los Angeles in the 1920s. Like many Wright houses, this one has a close connection to the landscape. The Tracys liked to hang out in this room in the evenings, listening to music and reading to each other. Wright designed the interior of his homes with just as much attention to detail as the exteriors. Tracy House, with its built-in library and Wright-designed furnishings, has been called a "jewel box filled with books and music." Turns out, opportunities to buy Wright-designed homes are more plentiful than one might think, according to Janet Halstead, executive director of the Frank Lloyd Wright Building Conservancy in Chicago, a nonprofit that works to protect his designs from demolition. One way to achieve that goal is to help sellers of Wright properties find buyers who will appreciate them and maintain and restore them, Halstead said. Toward that end, the conservancy has developed a service to help owners and their real estate agents market the properties through a page on its Web site, SaveWright.org. At the moment, the conservancy's "Wright on the Market" page has 17 Wright-designed properties listed (including one gasoline station). See Inman News for the full story.